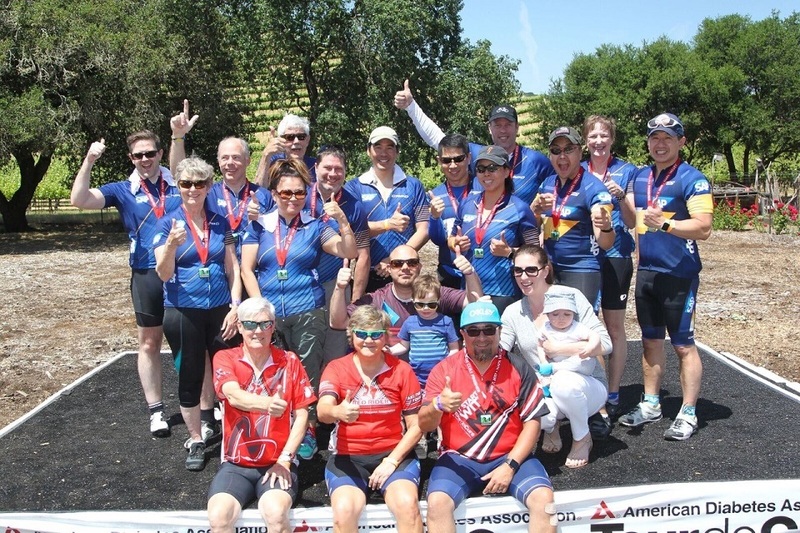 June 11th is the Tour de Cure for diabetes in Silicon Valley. It is the 9th year that Team SAP is riding and I am so, so proud to be on this team. I am a diabetic cyclist and seeing my worlds work together produces a special kind of magic for me. There are experiences that transcend both groups. One is the “do-over.” When a bike ride goes right, it feels so glorious, gliding down a hill and smelling wildflowers and the adrenaline kicks in for the next hill to climb. Yet we’ve all had that day that went unexpectedly South. The sun is shining and the sky is blue and then boom. Flat tires and broken chains, a quick decision and a faster fall. Hail storms? Or just not enough food or water? The list is endless. Someone mutters, “This is turning epic,” and we know what that means. At the end, we dust ourselves off and say “We need a do-over”. It is such an honorable trait. Persistence, dogged determination or obstinate continuance (as one dictionary suggested). In diabetes, we honor the same principle. If my blood sugar goes too low and I pass out or wake up shaking, I think of it as a learning experience. I will have a do-over. Next time I encounter this food or this ride, I will do it differently. I will change gears sooner and I will give way more insulin. Last year, 2016 was the first year Team SAP had ridden in the Tour de Cure – Napa. I was Team Captain and so incredibly honored. I carefully planned my meals and drank no wine all weekend in preparation for my perfect ride. But, not everything goes as planned. My excitement continued to grow the morning of the ride. I couldn’t stop smiling and my stomach lurched. That stomach flop was probably my liver dumping sugar in my blood stream. The classic fight or flight syndrome, except my body couldn’t handle it. I’ll skip the boring details of the 2016 Napa ride. Suffice to say, thank goodness for groomed green grass, a shady tree and three Team SAP teammates willing to help their Captain troubleshoot. I limped to the finish line. The photographer taking finish line photos nearly got run over by my bleary eyes and slow brain! This year I knew stopping early was a legitimate option. The phone number of the nearby sag wagon was on my wrist and my cell phone was fully charged. Plus, Team SAP had a beautiful tent. Scott Lawley and I had decorated the day before with large SAP flags. It would be a comfortable resting place no matter when I came in. There are many ways of being a captain and sitting with people and chatting about diabetes, cycling or SAP would also work. But I wanted to ride. My teammates helped that happen again. My good friend David S., who is himself a type 2 diabetic, and his friend Roger rode with me and we all enjoyed the gentle hills and milder weather. The chattering in my head, “How do you feel now? How about now?” finally slowed down to a mere murmur. This year I felt like royalty crossing the finish line. They announced Team SAP – Napa was #5 in the Corporate division!! 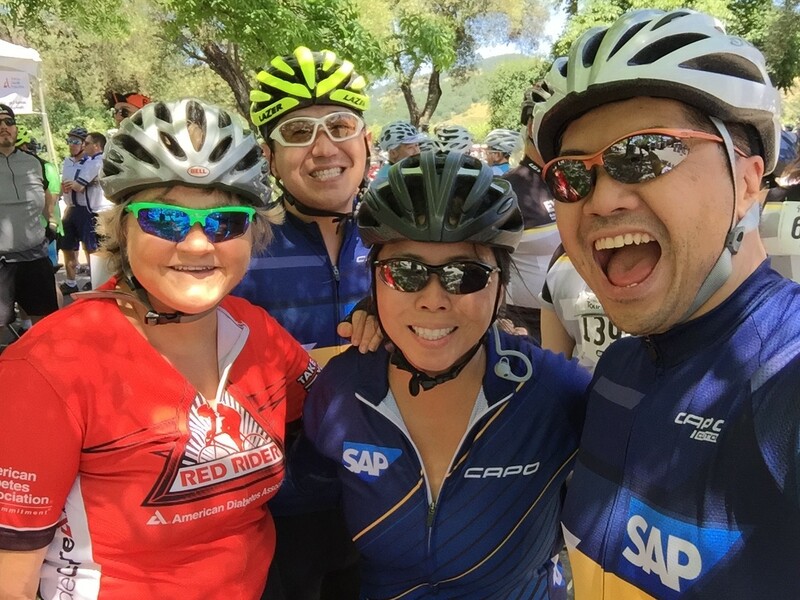 Many of the same SAP employees that rode in the Napa ride are also riding in the Silicon Valley one. We enjoy the sport, the camraderie and feeling we are making a difference in the world of complicated heath problems. Someday we will solve the diabetes problem and ensure everyone has adequate healthcare. Until then, we will keep riding or walking or whatever we need to do. All donations are most appreciated! Amazing Post Cheryl! Thank you for being our Captain! I’m glad we got to see you at the third rest stop! You are an inspiration. Thank you for your leadership! You did not let on that things were “EPIC”, I thought you were just relaxing in the shade!! !